I use a lot of hand tools and am always concerned about dropping tem on the concrete. Has anyone used these foamy tiles? If so any pros or cons of using them? Any other considerations or advice on flooring are welcome. Another option is 2×2’s on the floor with sheeting on top. You actually don’t even have to anchor the 2×2’s if you’ve got a flat floor. Or you can. Then put a coat of water base porch and deck. Tough and durable. 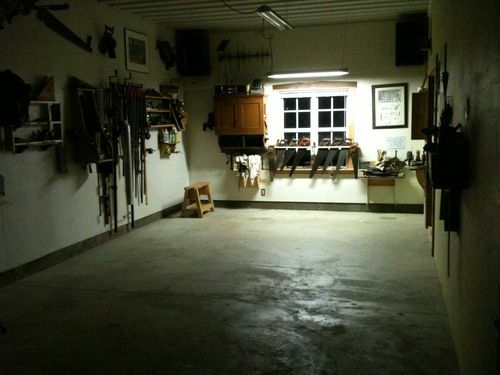 The slab floor in my house is done this way (anchored) and it’s been great for decades. For a very solid and non bouncy effect if you do this is to use edge locking floor sheeting or put a double layer across seams. I use these rubber stall mats around my workbench. Stiffer than what you pictured above. How about the ones Marc Spagnuolo uses? They’re 8mm thick solid rubber tiles. I’m actually debating on getting them myself. It’s just a matter of budgeting as a full 20×20 garage can get expensive. What I am doing now is to lay 1.5 inch thick foam insulation board on the concrete with a border of pressure treated 2 by 4 or shop wall. On top of the foam board goes a plastic sheet for a moisture barrier. Then a first layer of 4’ by 8’ of 1/2 inch thick underlayment running north-south. 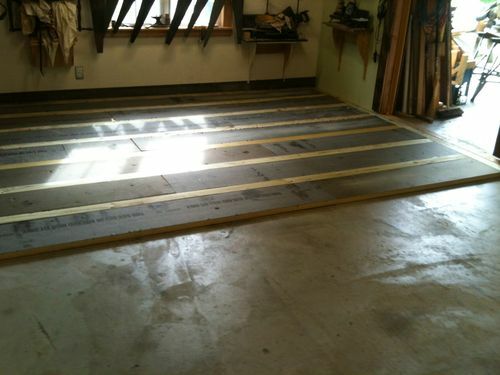 Then a second layer of 4’ by 8’ of 1/2 inch thick underlayment running east-west. The two layers are then screwed together. 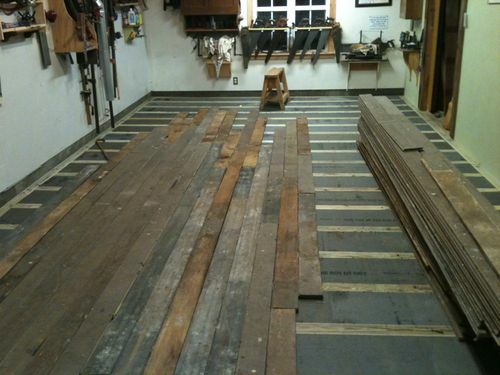 Having thought about shop floors for a long time I think this is the best afordable option. How about the ones Marc Spagnuolo uses? They re 8mm thick solid rubber tiles. I m actually debating on getting them myself. It s just a matter of budgeting as a full 20×20 garage can get expensive. I think you have actually identified the second of TWO issues. 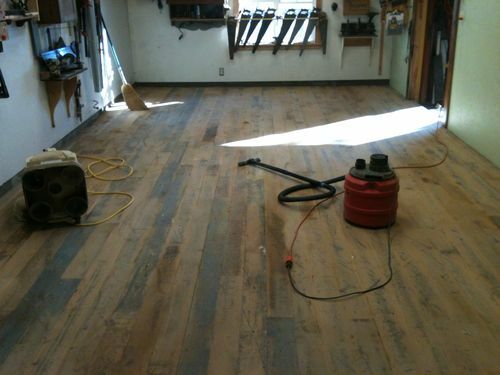 the rest of the flooring in the shop. IMO, one would not be using their handplanes in/at all places in the shop. Plus it would be easy enough to dedicate hand-tool “safe zones” when using them. 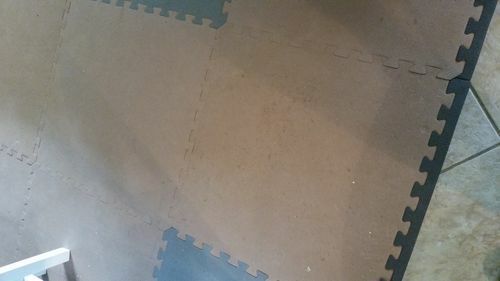 As for rubber mat throughout the shop, I can already attest at how difficult it is to move “mobile” machines over any of these vulcanized particle rubber mats. Between my router and TS, I use a 1/4in solid rubber mat. Not very flexible, but it can save things like chisels, hammers, wrenches, etc. And it is easier to roll machines on. Note: No longer sold by TSC, so no link available. 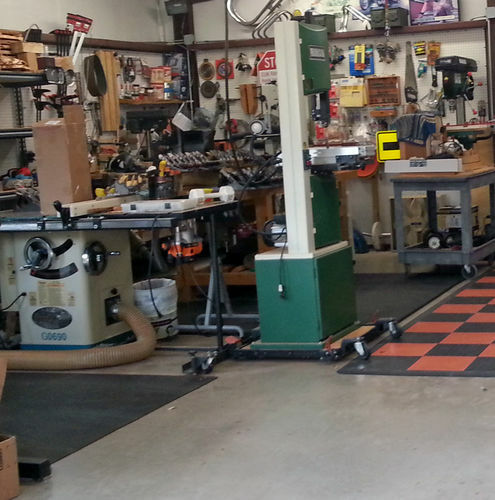 Under 1/4 of my shop, I have plastic “RaceDeck” installed, for when working on the Harley. As far as saving more fragile handtools such as planes and the like, the 3/4in stuff I linked above, is about as good as one could get (and that stuff is not perfect either). You have a legitimate concern. I position similar foam pads in front of my work benches and stationary tools where I may spend considerable time standing. They are much better on my legs and back then the concrete floor. I wish I could run them throughout the shop, but as pointed out previously they are not compatible with some of my mobile power equipment. Another option is tongue and groove subloor panels (like dricore) with a layer of cheap 1/4 or 3/8” plywood sheathing on top. Good insulation, water tolerant, soft underfoot and if you destroy part of the flloor you can just replace that piece of sheathing. Dricore is a bit expensive but fast and easy and strong. Several good ideas and tips on this thread, Thanks for those who posted. It gave me something to consider for future shop upgrade. +1. Thanks everyone for your thoughtful input! I live in Northern AZ at 6700 ft elevation so I just bought some but more to keep my feet from getting cold. DON’T BUY HARBOR FREIGHT INTERLOCKING “FOAMY TILES!!! I bought two packages at the Show Low store and decided they work for my purpose so I decided to buy four more packages (2 ft x 2ft). We live ~35 miles from the Show Low store so I didn’t rush down there for more. We were in Flagstaff last week so I bought four more. They are different, even between the four packages I just bougt!! The “dovetails” are slightly different spacing, slightly different thicknesses, enough to make them pucker and create a tripping hazard, especially if you want to have them more than one width. As a four foot square as shown on the package or four pieces in a row then OK but otherwise it’s a crap shoot. Maybe I’ll post a review on this site. It would probably be better if foam tiles were sold square without the interlocking tabs. You would secure them together on the back with some strong tape. Perhaps carpet tape. Perhaps a glue on the edge. i just picked up some matts at costco, as my wife had one at kitchen sink, and i liked the thickness and softness of it. they are about 4 ft long, i’d and at least 22 inches wide, tapered on edges so no absolute edge to stub toe on, and about and 1 inch thick, easy to pick up. As everything in my shop is on wheels, i used one a bit yesterday whilst standing at band saw making some scrap, and it was a pleasure, as before i was standing either on concrete or a chunk of used carpet i have around for setting pcs on so as not to mar them. wanna say the pads were less than 20 a piece. i picked up several to see how they work, as mentioned, easy to move around. to stations used. Yes I use them and they are ok cheapest way to go. Advantage of interlocking pads are you can customize the layout very easily. I get the ones Sam’s sells. Keep in mind horse stall or trailer pads are quite stiff and not anti fatigue. And expensive. I have a low-pile carpet in most of my shop, it was there when I moved in. I wasn’t sure about it at first but it is actually quite nice. It protects my bladed tools and the wood chips don’t get stuck in it too much. I use a broom and old vacuum to clean up. 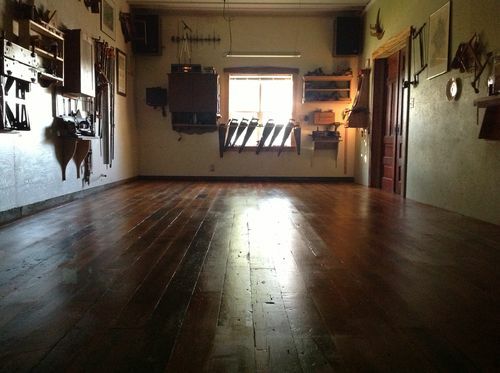 Wood floor, if you can.